WEP has been broken for years... Why are people still using it? This weekend it is both cold and snowy in my area. 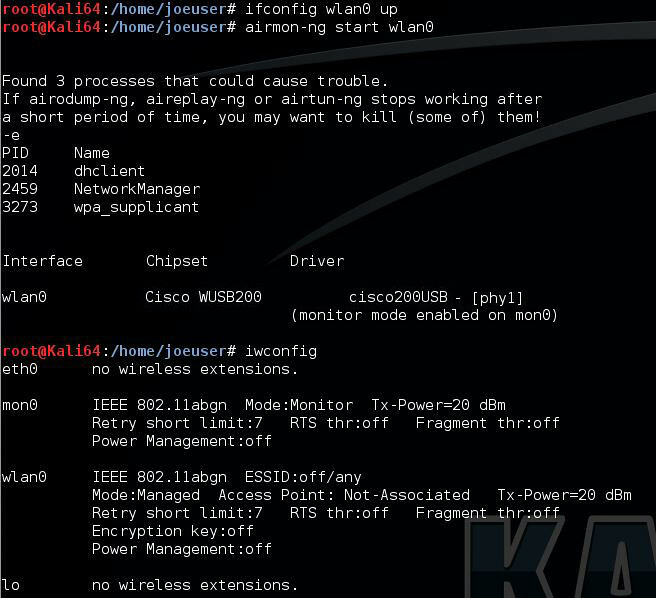 I'm in the process of upgrading VMs and decided to upgrade my Backtrack instance to Kali Linux 1.1.0. As part of this process, I needed to test my Wireless Adapter's compatibility. I plugged it in and fired up airmon-ng to see if monitor mode was working properly. To my surprise, I noted at least (2) WEP access points, (1) WPA, and the remaining were WPA2. Additionally, only (2) AP were not broadcasting their SSID. A hidden SSIDs can be revealed in about 5 minutes worth of work but at least make an attacker work for it. Step 0) Change MAC address to hide your identity. I marked this step 0, because ideally you are attacking yourself and you shouldn't need to do this step. It is not ethical to attack your neighbors or other networks..... even if they are using technology from 2003. Regardless, I needed to test if my WIFI card supported MAC changing. To change your MAC address you need to shutdown the wireless interface and change the address (we will bring it up in a later step). 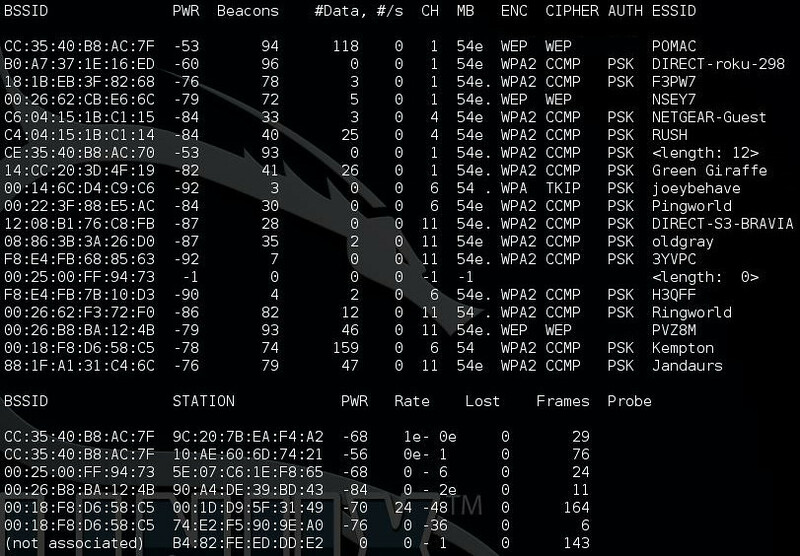 Step 1) Bring up Interface and turn on "monitor mode"
Using airdump-ng on the monitored interface, we can see all of the networks visible to our wireless card. Below is a capture of the surrounding "wireless pollution" with my network set to WEP. I've selected my network (POMAC) which is on Channel 1 with BSSID CC:35:40:B8:AC:7F. I'm going to log the traffic to traffic set name "POMAC"
Screenshot ommited... it looks like the previous step, but filtered to only one BSSID. Step 4) Spoof Association with the Access point. We need to have an associated MAC address with the access point to perform injections on it. The fake authentication will associate us with the access point. We need to have an associated MAC address for the next step. To do this we will use aireplay-ng. We will use the BSSID (CC:35:40:B8:AC:7F), our MAC address (00:08:25:11:A3:D7) and the ESSID (i.e. network Name) POMAC. This may take a few seconds. You might get multiple successful "Authentications" before you successfully "Associate". We are going to use ARP Replays to generate new initialization vectors (IVs). The program listens for an ARP packet then retransmits it back to the access point. This, in turn, causes the access point to repeat the ARP packet with a new IV. Remember from above, statistically, after 5000 messages an IV will repeat allowing us to crack the key. After reaching 5000 (10000 recommended) in the #DATA column of the airodump-ng window, you can kill the ARP Replay window using control-c. You can then also kill the airodump-ng window. At this point, there will be a number of files named POMAC-01. * in the directory you launched the airodump-ng window. In the first window (the airodump-ng window), we will use aircrack-ng to reveal the key. STOP USING WEP!!!! Also, don't name your AP something that reveals possible attack avenues. The SSIDs of the WPA/WPA2 AP with names hobby/interest related just help an attacker figure out what dictionary to base their attack. (i.e. the Golf based SSIDs have a golf themed password, Music/Band based SSIDs... etc). Also, turn off the SSID broadcast.